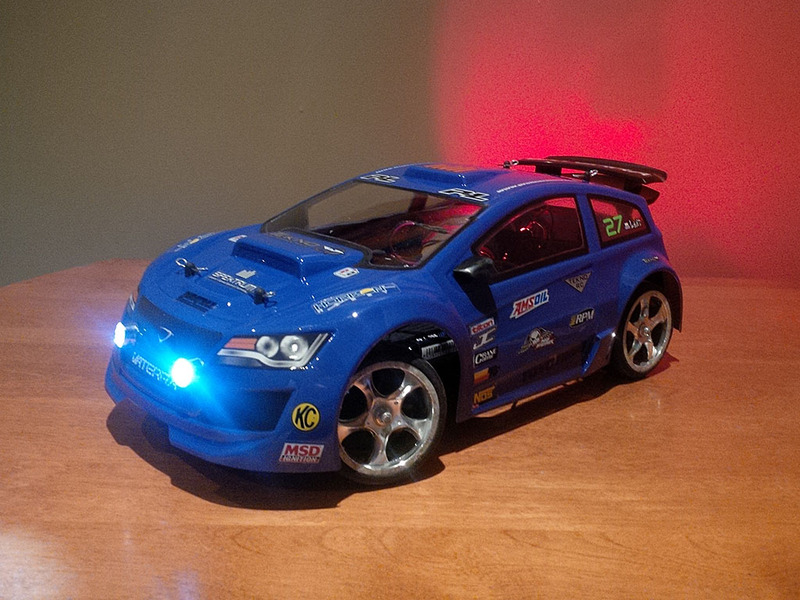 A while ago a buddy of mine introduced me to a small 1:14 scale rally car. The Vaterra Kemora. It’s decently well made, small RC car that comes with a brushless motor (4500KV) and even a Spektrum 2-channel radio. All for under $200. What really amazing about the price of the kit is that the individual replacement parts add up to much more than $200. It’s actually cheaper to buy another Kemora kit than order individual parts. This is just the perfect car for a small indoor track, like one we found locally not too long ago. The biggest expense on my part was getting a few batteries for the car. While a lot of cheap options exist. I opted for the Traxxas #2820 2S Lipo packs. They fit the battery cavity well and provide healthy amount of capacity for nice long runs. Unlike a lot of cheaper batteries, they seem to keep their balance a lot better across cells and do not require balancing with every charge. The car does have some minor issues though. The local track uses silica covered painted concrete floor. Very harsh on the stock tires. The stockers went bald after only few batteries. Between few friends and I’ve tried several tire/wheel combinations that would last at the track and still give relatively good grip. I found the perfect combo! 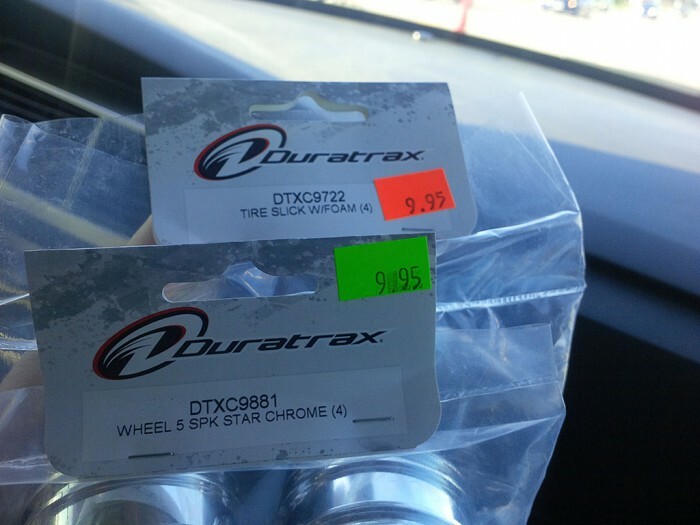 Duratrax Slicks (DTXC9722) and Wheels (DTXC9881). One of the cheapest and toughest combos we’ve tried yet. I have countless laps on these tires and a lot of contact between other cars and the walls and both wheels and tires are holding strong. Unlike a lot of slicks which are very plasticky, these tires are made from very sticky rubber. Even on the silica floor they provide just enough grip to go into corners fast but with just a blip of the throttle allow for easy drifts. 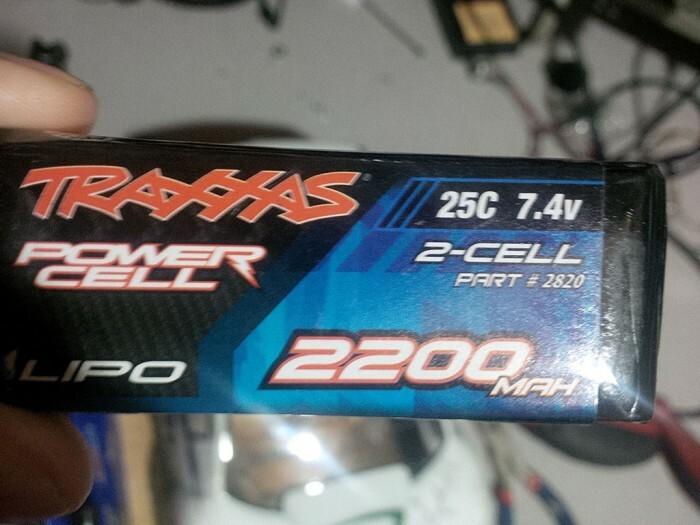 The motor runs very hot even on 2S batteries. We’ve seen upwards of 190F on the motor after a full battery run. I can’t imagine how this motor is to survive running on 3S. A motor heatsink is definitely recommended though due to the space constraints it might be difficult to find one that will fit. Currently running without the Chassis Cover to help keep the ESC and motor cooler. Will keep a lookout for a decent heatsink for this. Another minor issues is the front axles have a tendency to pop out in minor collisions. The axles use a dog-bone design that takes a little bit of force to pop back in without having to take the tire off. It’s more annoying than anything, fortunately Vaterra offers upgraded axles that do not have this issue. Lastly, the NiMh battery that I got with the truck was completely dead. It had an actual capacity of about 250mAh and cycling the pack repeatedly was not enough to bring it back to life. Not a big deal on my part as I was never planning to run on NiMH but again, something that Vaterra should address. Issues aside this car is incredibly fun to race. And after countless laps and countless of collisions and rollovers, not a single part has been broken yet. It’s amazing actually as we’ve had some rather bad wrecks. After few hundred laps the stock body was getting pretty beat up (too many collisions). I got a new blank body and painted it. Added some nice lights by using 0.5W Ultra Bright 8mm LEDs for front and rear. Unlike my flasher project, these are just running lights. I’m really digging this car. It’s a lot of fun to race for very little investment. And since it’s waterproof, it simply takes a quick hot shower in the sink at the end to clean it off. Hats of to Vaterra for this. Sounds like Traxxas has some real competition to their 1/16 Rally VXL. This entry was posted in RC Hobbies by Tom Heiber. Bookmark the permalink.